With this Blu-ray ripping program, you can remove protection from Blu-rays and lossless re-encode Blu-rays to MKV, MP4 format and compress 1080p Blu-ray to compatible size for in-house media server. Of course, this Blu-ray ripper can help you convert commercial Blu-ray movies to AVI, WMV, FLV, MOV, etc as well. What’s more, it can also enable you to rip Blu-ray for directly playback on Android, iOS, Windows based devices and even backup Blu-ray in lossless mkv for watching on media players with multiple audio tracks. If you are using Mac, you can turn to ByteCopy for Mac. Now, download software and start conversion. STEP 1. Insert your Blu-ray disc to the drive, then launch the Blu-ray ripping software and click the “Load Disc” button to have the Blu-ray content imported. You can also add Blu-ray folder, Blu-ray ISO files are the source files for converting. Step 2: To choose a format for playing on media server, go to “Format” bar and select “Common Video > MKV(Matroska) Video (*.mkv)” format. 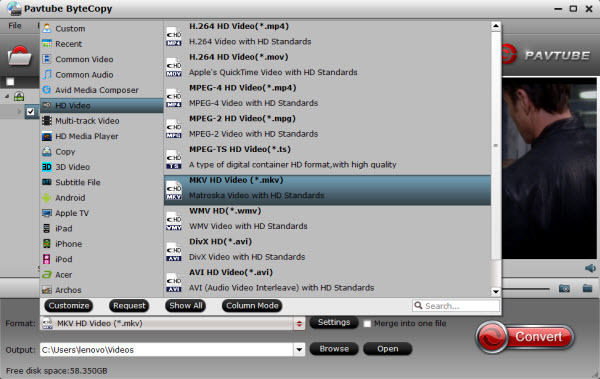 You can also choose the “MKV HD Video(*.mkv)” from the HD Video sublist. You can also backup your Blu-ray to Network storage devices Drobo 5n and NAS for storage and streaming. 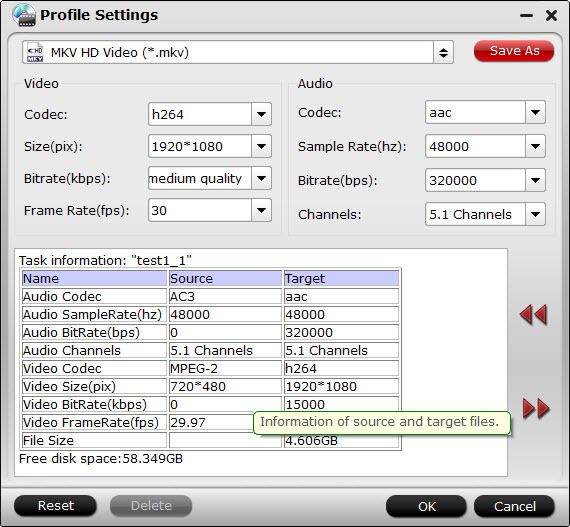 Note: If the default settings can’t meet your needs, you can freely to adjust these parameters including video bit rate, frame rate, video size, audio channel, audio codec, sample rate, etc. Step 3: After all settings, tap “Convert” button to start Blu-ray to media server conversion. Once the conversion completes, you will be able to get the output files via “Open” panel effortlessly. 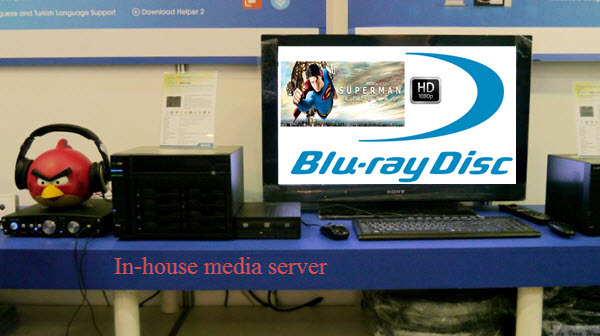 Now, you can easily transfer and watch Blu-ray movies on in-house media server like Plex, Mede8er, etc, and then stream to your media computer. Just Enjoy with family and friends in living room!